This post has been in my draft since Xmas. Using leftover is my Achilles heel. I made this Iced Tea way back then but didn’t post as it was too wintery to enjoy Iced Tea. I used up Candied Ginger Syrup already as Ginger Ale. It’s time to use the leftover from Candied Orange Syrup. I am not a tea drinker. I rarely drink it. Ever. So I was quite sceptical when I made this tea. But all my apprehensions were ill-found. 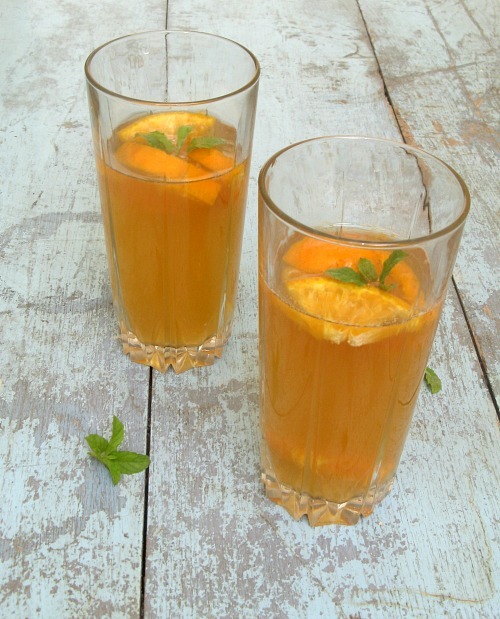 The tea is very refreshing and soothing as a Summer Cooler. It is perfect as on-the-go drink with goodness of citrus fruit in it. It is quite simple to make too. Over to the refreshing goodness. Boil 2 cups of water, place loose tea in a Japanese closed strainer in it for 5 minutes. Pour 2 cups of water into the mix, and add sugar or lemon to taste. Pour this mixture into a pitcher. Add sugar syrup. Stir this into the mixture.Adjust as per your taste. You can sprinkle sliced fruit with a bit of lemon juice. Add the fruits slices to the pitcher. Stir it around until the fruit mixes in with the black tea and floats evenly in the pitcher. Serve the tea. Pour the tea into a glass filled with ice. Add a sprig of mint to the top. 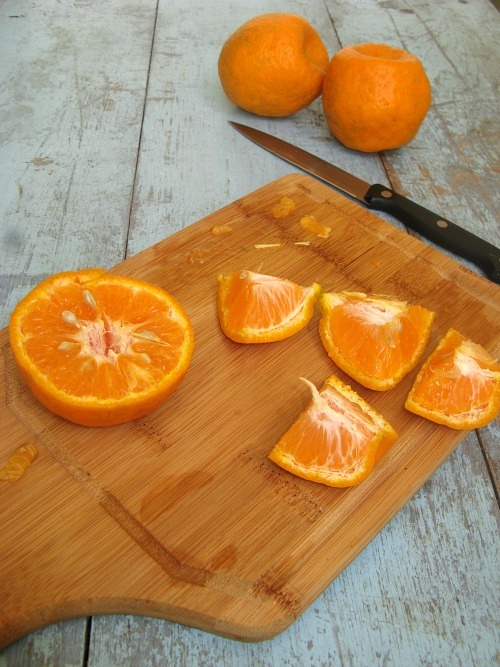 You can replace oranges with any diced fruit like Peaches, Pineapples, Strawberries, Raspberries and Apples. You can add more sugar if you like. We prefer mildly sweet only.